The Shari Flaming Center for the Arts was dedicated in December and will be completed free of debt, officials say. Tabor College has announced that the Shari Flaming Center for the Arts, which was dedicated and opened in early December, will be completed debt free. “With the combination of end of year gifts and the ongoing fulfilment of donor commitments, we are pleased to say that the building will have no outstanding debt,” said Jules Glanzer, Tabor College president. Glanzer announced at the dedication ceremony that $150,000 in additional funds was still needed to complete the Shari Flaming Center for the Arts with no debt. Glanzer said he is especially pleased that the last effort of the campaign, called the Grand Finale, exceeded expectations. Ron Braun, vice president of advancement, and the team of fundraisers at Tabor have been working for six years to complete the project. Community support for the building has been apparent based on attendance at opening events. 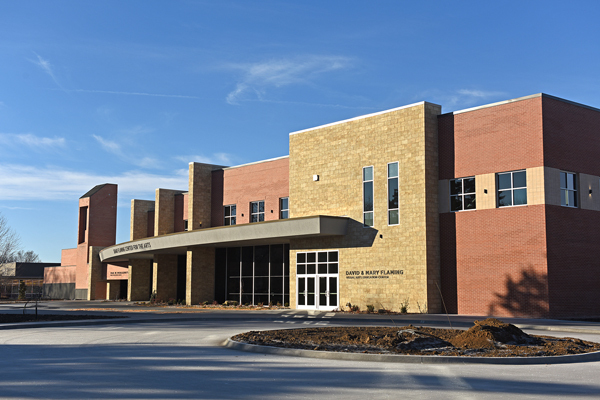 More than 800 people attended the dedication ceremony on Dec. 9. The Tabor College Oratorio and Alumni Chorus and Community Orchestra performed Handel’s “Messiah” for 1,100 guests the next day. Both events were streamed online to audiences around the country. The new building will host arts events for the public, including student and guest performances. Beginning in the spring semester, the campus community will gather in the auditorium for weekly chapel. The center includes a “We Proudly Serve” coffee shop, opened Jan. 4, which offers Starbucks coffee and specialty drinks. The first guest performance in the Richert Auditorium will be a Winter Classics Concert by Newton Mid-Kansas Symphony Orchestra and is scheduled for 4 p.m. Jan. 28. Tickets can be purchased through the group’s website or are available for pick up at Faith & Life Bookstore or the NMKSO office, both in downtown Newton.